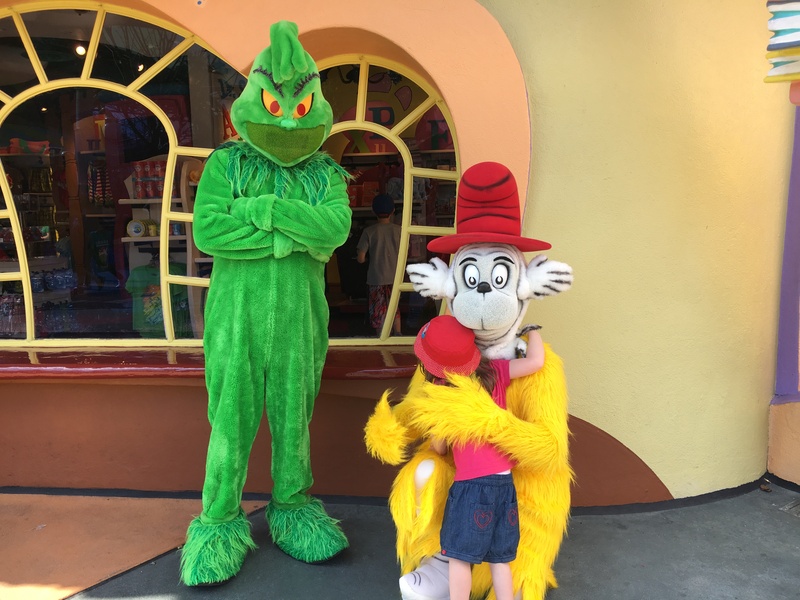 I had bought myself a ridiculously expensive ticket for Universal Studios and Islands of Adventure, which allowed me to go to the park as many times as I wanted over a 14-day period. Realistically I knew I wouldn’t really go more than three times, but it was almost the same price to buy a two-day entry, so I thought I’d go the whole hog. TheBloke (TM) and Mr Nunn each bought a one-day entry, so I went once with my Mr Nunn, once with TheBloke (TM) and the plan was to go once by myself for a hedonistic single-rider experience of no queues, no children and as much Butterbeer as I could stomach. 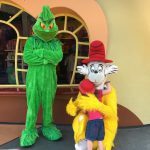 We had taken EldestGirl to Universal when she was nearly two, and found not that much for children her age, so didn’t plan to bring her there this year. 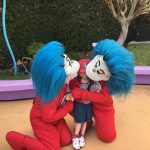 Not least because an adult ticket was $155 and a child ticket was $150; she was too small to go on a lot of the rides, and as mentioned before, she was hardly a thrill seeker – it would have been an absolute waste of money. 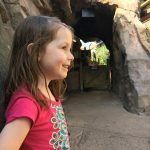 However, EldestGirl and I had both enjoyed our day at the Magic Kingdom so much that I did wonder if we might try her on some bigger rides – particularly as she said she had enjoyed the exciting drop on Pirates of the Caribbean. Now, this will split the room, and I’m prepared to take the flack for this one; I decided to try and get her in as an under-3. Under 3s are free. Yes, this was ridiculous, as she’s four and a half (albeit petite). And if it had been, say $50, I would have coughed up, no question. But I already had my ticket, and I kind of felt that even if we got turned away at the gate, there was nothing really lost. I didn’t really fancy another day in the park by myself, as I’d already done most things twice with TheBloke (TM) and then again with Mr Nunn, so if we didn’t get into the park, we’d just write it off and get a nice lunch together instead. I knew EldestGirl was not a big fan of rollercoasters and got a bit nervous looking at them, but she had never tried a simulator before. I am always a lot less scared of simulators than I am of rollercoasters, as I know it isn’t “real”. With this in mind, I pushed EldestGirl straight towards Despicable Me (one of the more adrenaline-pumping, higher-octane simulators), with the logic that that ride usually has a longer queue, so made sense to hit it early, plus if she hates it, we will know for sure there’s no point doing any of the other bigger rides with her. It was our lucky day. Carlito who was working on the on the queue gave us access to the Express Pass queue for no good reason whatsoever, and we were pretty much straight on the ride. EldestGirl was very nervous, and I didn’t really watch the ride much as I was keeping an eye on her to see if she was getting scared or crying – hard to spot with 3D glasses on. When we got off, I realised she’d been laughing hysterically. She loved it. This was the true birth of my adrenaline junkie. Over the next few hours she did The Simpsons (another simulator), Spider-Man (a fierce simulator with some quite scary bits – which she loved) and utterly shocked me by wanting to go on the Harry Potter rollercoaster Flight of the Hippogriff. I had misremembered how fast it was, and by the end of the ride, was quite keen to get off myself. I checked to see how EldestGirl was. “Let’s go on it again, Mummy!” So we went on it again. She wanted to go on a third time, but by then I was taking ibuprofen in an attempt to keep up with her. 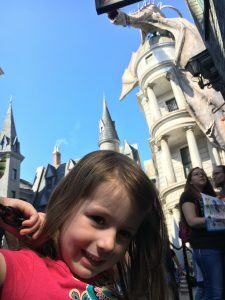 She adored Hogwarts and Hogsmeade and Diagon Alley. She enjoyed Ollivander’s Wand shop, and was reasonably good when I told her no, we were not spunking $40 on a fricking wand. She didn’t want to go on the Hogwart’s Express a second time because it was “too slow and boring. Why aren’t I big enough to go on Gringotts? It’s not fair!”. 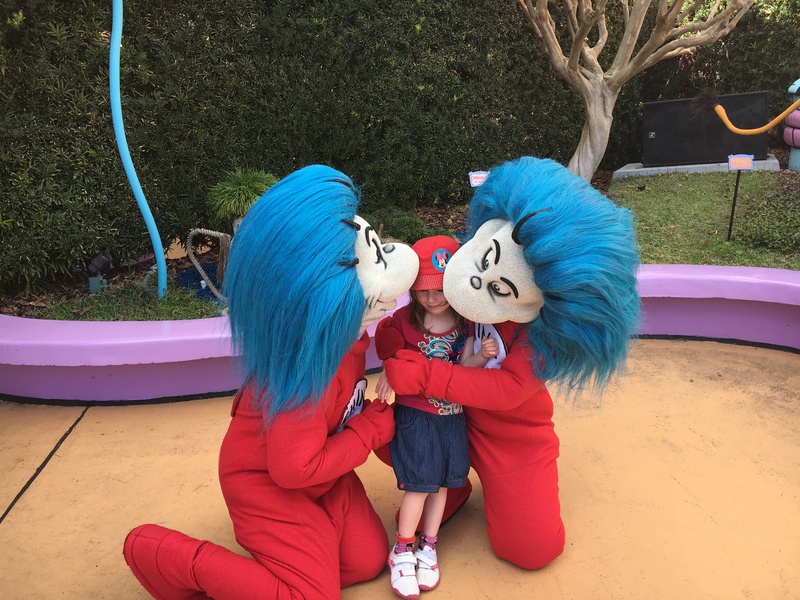 She really loved Dr Seuss Land and we spent ages there doing several rides several times. 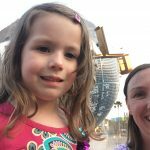 Particular favourites were the One Fish, Two Fish ride that squirted Mummy (hilarious) and the If I Ran the Zoo play area, which I didn’t even remember seeing previously – it’s a fantastic area full of mazes, tiny windows to peer through, water play, slides, buttons to press – just perfect for preschoolers. 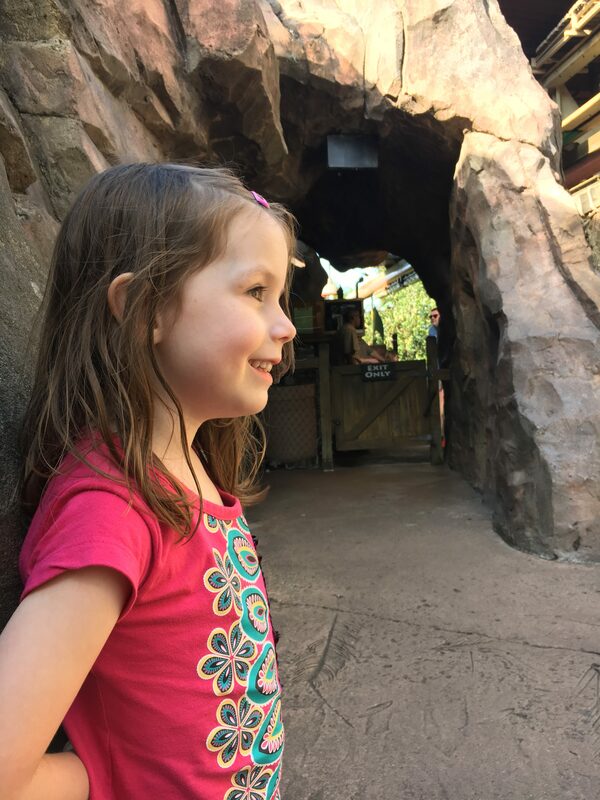 She spent a happy hour waiting in the adventure playground for the Jurassic Park Pterodactyl Flyers. You are only allowed on this ride with children, so this was a first for me. It was also a last for me as they were bloody terrifying, with your legs dangling, being thrown through the air. EldestGirl loved it. 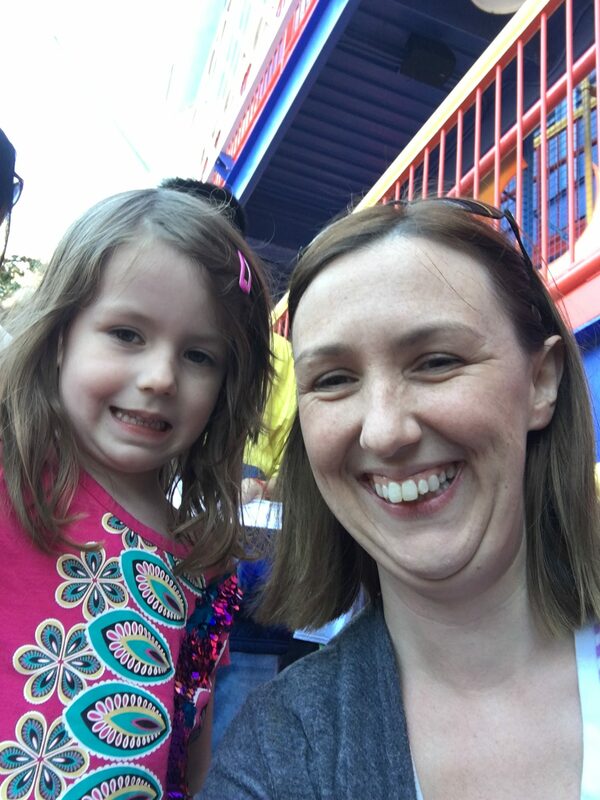 We rounded the day off at Fievel’s Playland where another first was made – EldestGirl decided to go on a ride that Mummy was too scared to go on. I have never been a fan of big drops – huge slides, log flumes etc. This, of course, is EldestGirl’s favourite thing. 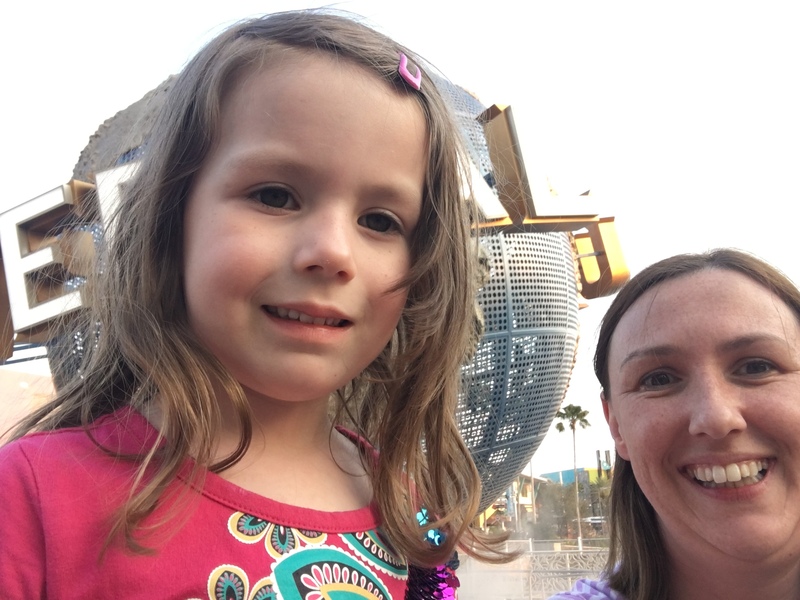 So it was a very brave four year-old that went all by herself down a 200 foot water slide, and once off the slide, waited alone by the bottom whilst Mummy ran down 200 feet of stairs. This is the same four year-old who six months ago was too scared to go on the Learner Driving School at Legoland. A monster has been born. We had intended to meet TheBloke (TM) at the guest drop-off point at about 2 p.m. – after much re-liaising, we rescheduled for 5 p.m. – and were having so much fun we were nearly late. Would I have paid $150 for her day? No, not on top of all the other treats we had. But it was an unexpectedly brilliant bonus, and lovely to see my favourite theme parks through fresh eyes.